Our boat neighbours, Thierry and Marie Ange offered to bring us to this annual festival, giving thanks to Saint Vincent the patron saint of wine. The festival started in 1938 and it is held in different towns each year. 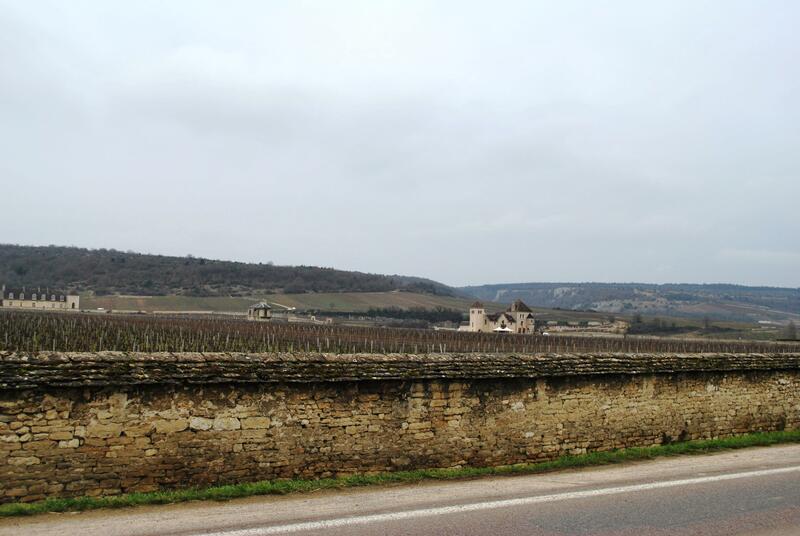 In 2015 it was the towns of Gilly-les-Cíteaux & Vougeot, turn to host it. We were amazed at what we saw and experienced. 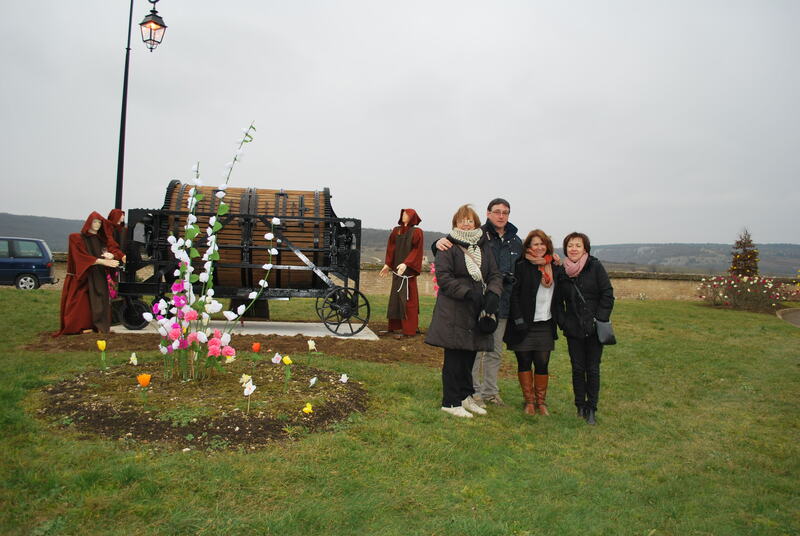 We left Chalon at 10.00 in Thierry’s car- Marie Ange, Nuala and I and their good friends Manu and Francoise. We arrived at Vougeot to be meet by a police check point and road marshals. We were told to proceed towards the village and park on the road side when instructed to do so. It was all very well organised. We had to walk four km into the village, which was very pleasant, as there were vineyards all along the road. 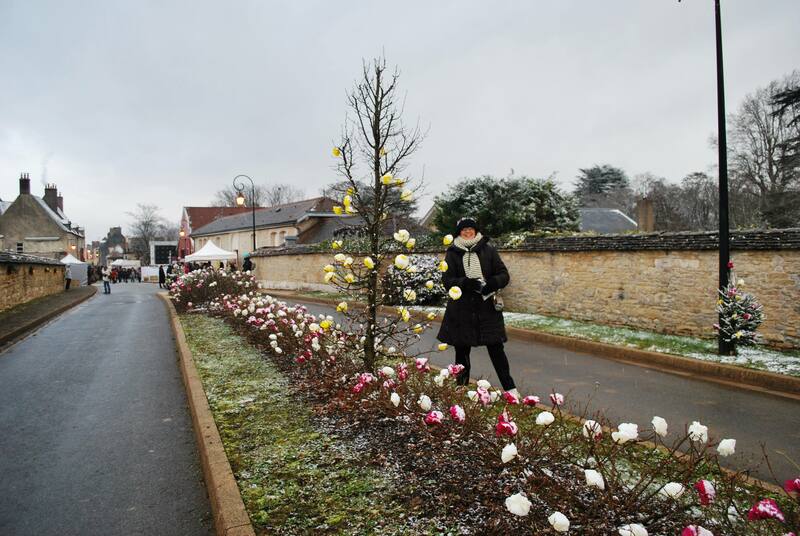 Reaching Vougeot we could see that the whole village was decorated for the occasion, with millions of brightly coloured paper flowers placed everywhere. There were also window decorations and figures of monks throughout the village. We could see the effort the people had put in to have their villages looking at their best. The reason for the figures of the monks is that it was the Cistercian monks who started wine growing in the region 900 years ago. 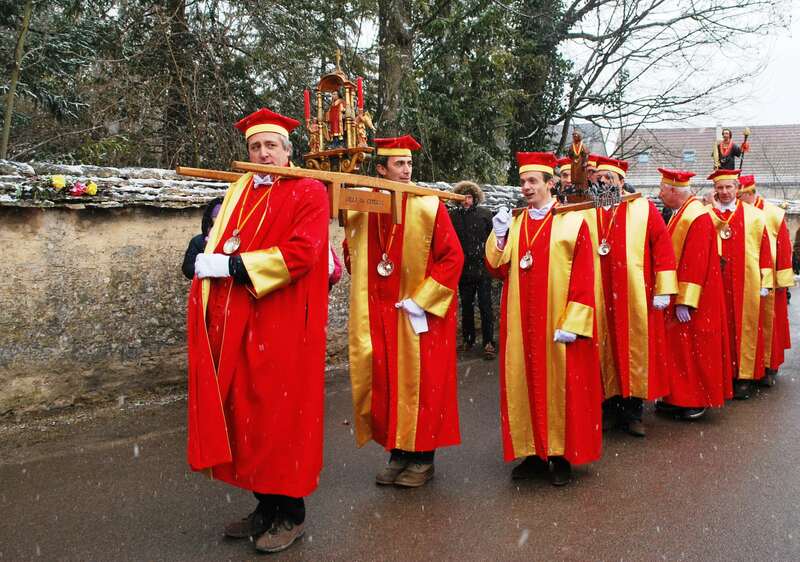 The rotating Saint Vincent Tournante(festival) was founded in 1938 by the Brotherhood of the Knights of Tastevin and each year it is celebrated in different Burgundy villages. 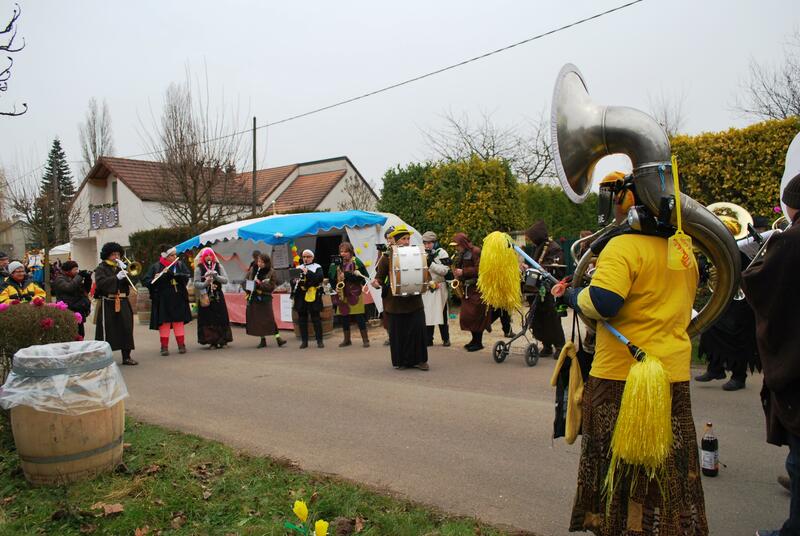 It’s a big honour for a village to get the chance to host the festival and the villages began preparing for it to two years ago. 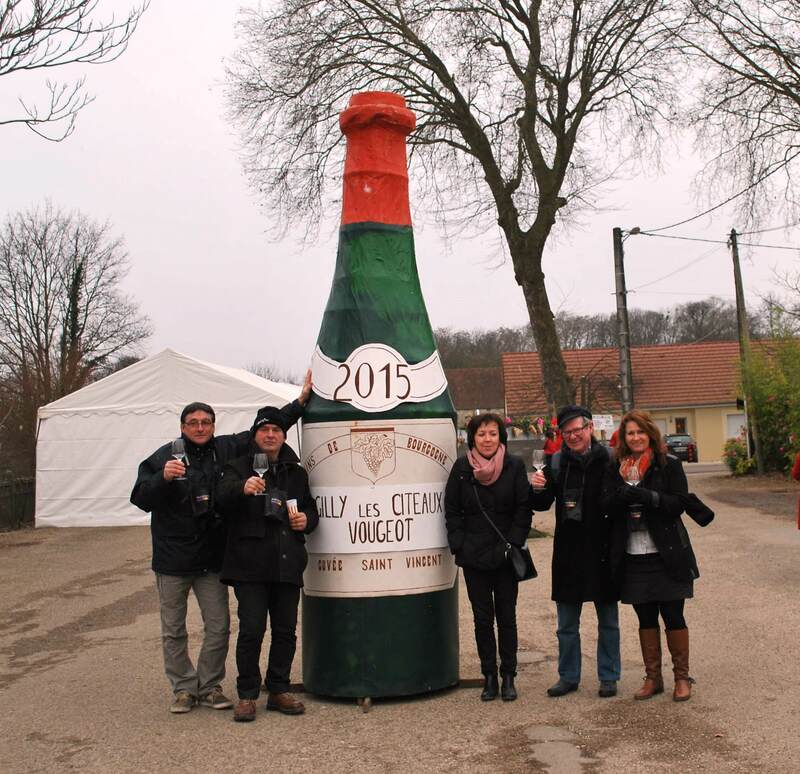 The last time Gilly-les-Cíteaux and Vougeot got to host the festival was 12 years ago. People visiting the festival can purchase a specially engraved wine glass, a small bag to hold the glass and tickets to taste seven different wines at caves (cellars of local wine producers) around the village for a cost of €15. So after the formal proceedings from 11 am until 5 pm the caves are open and people tour the village tasting the wine, eating food and looking at the exhibitions and craft stands. The musical bands tour the caves playing a few songs at each one, which helps the festive feeling. There are also demonstrations by local craft people, we saw a cooper making wooden wine barrels and metal workers making gates and ornaments from wrought iron. This gives fans of Burgundy and its wines, a chance to discover the heritage of the villages and to taste the specially selected wines. The local people go out of their way to make you feel welcome and around 40,000 people visit the villages over the two days, which makes it a great spectacle. Word of warning you need to wrap up well. It was bitterly cold and it snowed during the day. Because of the weather the red wines were served too cold and you could not appreciate their full quality. It was a long day as we did not leave until 5.00 pm. Anybody who gets a chance to attend this festival should. 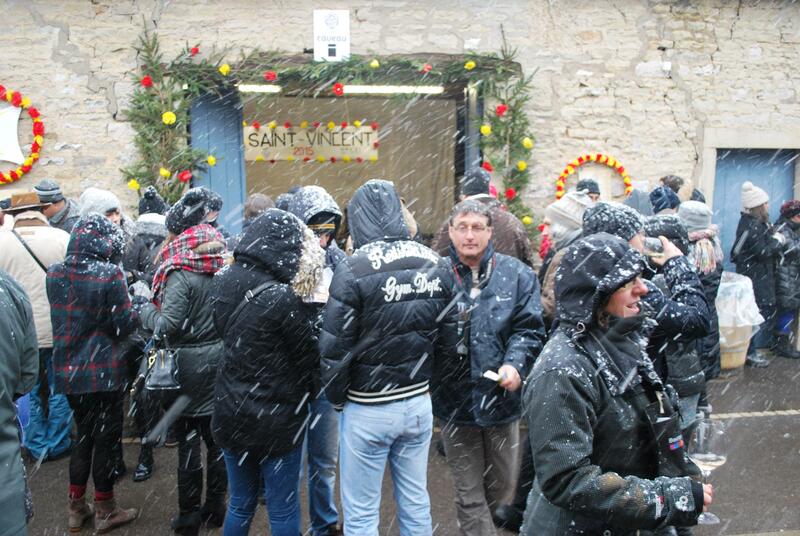 It’s a very special Burgundy event, we really enjoyed it and Nuala was delighted with the snow! These are all paper flowers put there one by one! This entry was posted in Comments on Social Economic Lifestyle in France, French Food & Wine, People We have Meet on the Gap Year, People who have helped us on our way, Travel Tips, weather and tagged burgundy, burgundy wine, Chalon sur Saone, Confrérie des Cheavaliers du Tastevin, Gilly-lés-Cíteaux, Sur le chemin des moines, Vougeot. Bookmark the permalink. 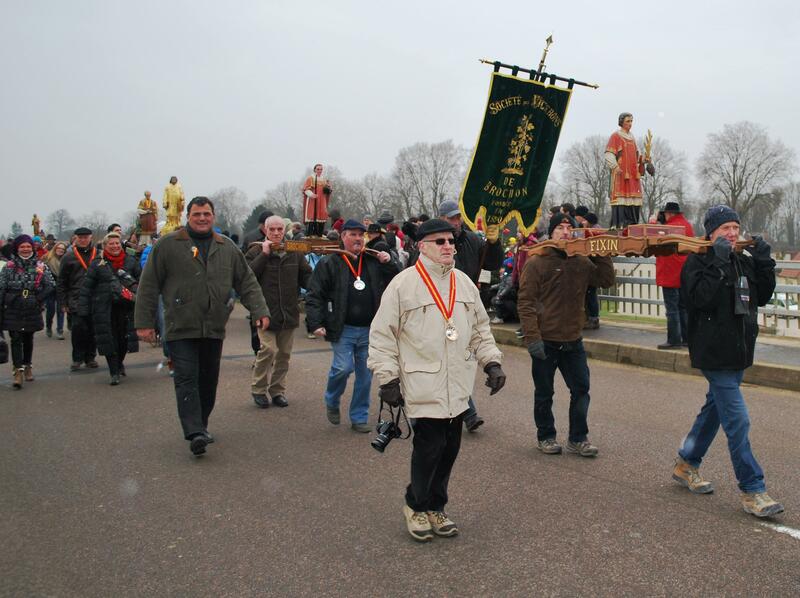 2 Responses to Festival of Saint Vincent Tournante – Festival and Wine and Burgundy Culture. At last, a festival really worth the trip; you lucky sod. I bet the 4K back to the car seemed longer.